Santiago de Compostela is the administrative, social and commercial capital of Galicia (Spain's northern- and westernmost region); declared a World Heritage City by UNESCO thanks to its multicultural nature and as the final destination of a thousand-year-old pilgrim route: the Way of St. James, which, since the 9th century, has transformed this finis terrae into a meeting place of Western faith and thinking. The old town is home to an important number of monuments that can be visited. 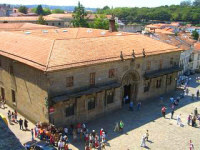 Its main streets or rúas (Franco, Vilar and Nova), of medieval origin, run parallel to each other from the surroundings of O Toural square towards the squares surrounding the Cathedral: Obradoiro, Praterías and Quintana, respectively. The former location of one of the city gates, Porta Faxeira, is the natural access from the old town to the Alameda. This city park, which is surrounded by the monumental quarter, the Ensanche (urban expansion area) and the University's South Campus is also the starting point of an interesting route around Compostelas green spaces. You can make here a virtual trip. The University of Santiago de Compostela is education and knowledge at the service of society. It is a singular institution due to its history, the impressive settings of Compostela and Lugo, where its campuses are located, its dynamism and its commitment to modenisation. Founded in 1495 by Don Lope Gómez de Marzoa, this institution maintains one of the most important academic traditions in Europe, being always attentive to the growing demands of society and open to international collaboration. 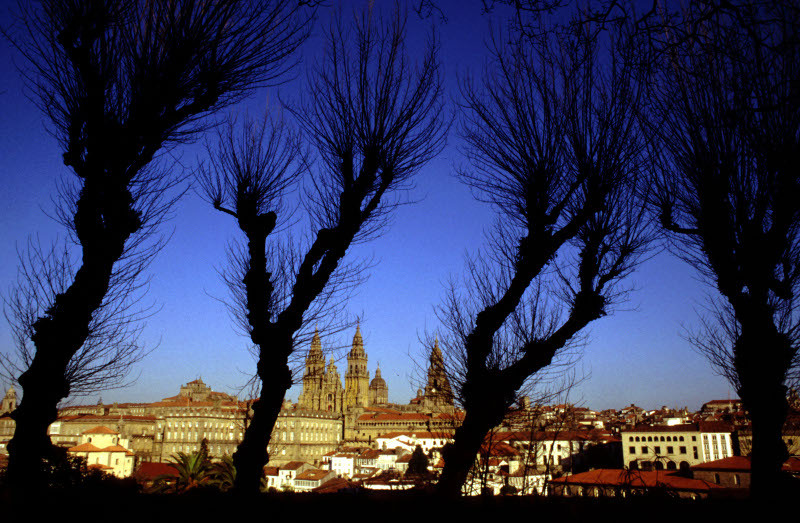 Compostela's gastronomy has become another highlight of the visit of those who appreciate good food and generous portions. Fresh produce, recently brought from the sea or the vegetable garden, which are proudly exhibited in the unusual still lifes decorating the windows of bars, inns and restaurants. At mealtime, the choices depend on the size of your appetite: large appetites can be satisfied with a three-dish menu; those wanting a snack can go for an informal meal made up of raciones (portions), i.e. platters of squid, octopus, omelette, peppers, salad, cheeseboards or selections of cold meats, which are normally shared among a group. The standard bearers of the best local cuisine are crustaceans and molluscs, a varied group that goes by the general name of 'marisco' (seafood). Special mention should be made of Galician-style octopus. The first dish par excellence is 'caldo gallego' (Galician stew), which hides the miraculous taste produced by potatoes, beans and turnips tops cooked with 'unto', the smoked pig fat that is omnipresent in winter dishes. Compostela's contribution to Galician cuisine includes the so-called 'tarta de Santiago'. 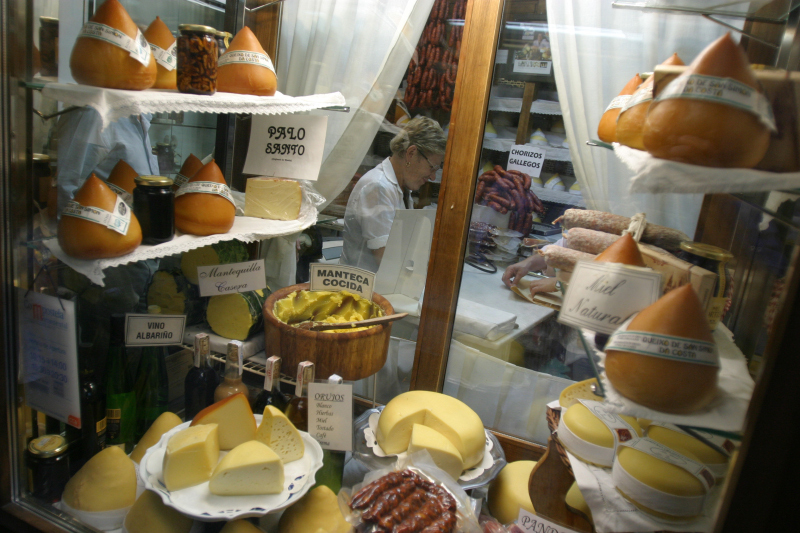 Santiago is surrounded by excellent cheese-producing regions such as Arzúa-Ulloa, O Cebreiro or San Simón. The Galician cheese par excellence is 'queso de tetilla'. To wash everything down there are wines from all over Galicia: light and young white wines and strong red wines. And to round off a good meal there is eau-de-vie, which can be served as herb liqueur, coffee liqueur or in many other ways. It is also used to make queimada, flamed eau-de-vie with sugar, orange or lemon rinds and coffee beans, which is made while reciting a spell against the curses of meigas (witches) and trasnos (goblins). 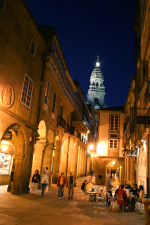 Enjoy a night in Compostela walking around the illuminated city, having a relaxed dinner, conversing over a few drinks, attending a cultural event or going out for some wine and tapas to the most popular places. There are always places open and cultural possibilities for the night. Unlike other cities, here it is normal to go out for a drink even on a Sunday or Monday. 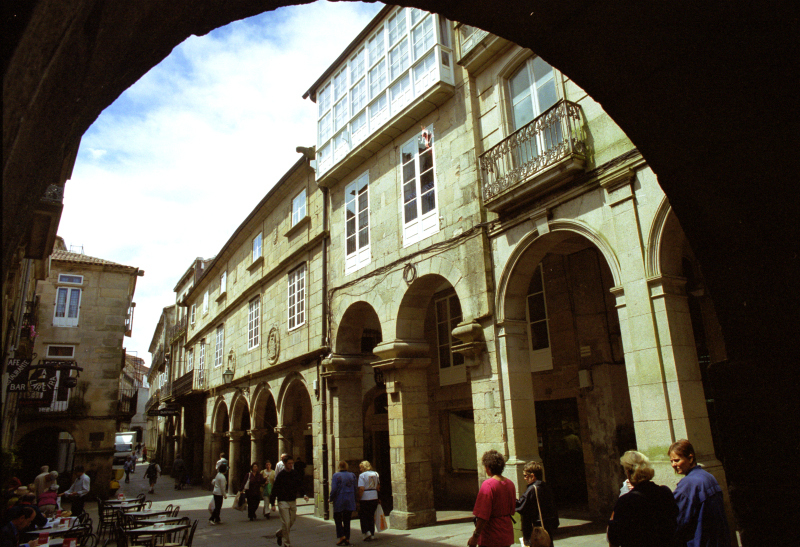 The street is never completely deserted, because Compostela is never completely asleep. At nighttime in Compostela, you do not need a car since you can easily walk around the city, and doing so is very pleasant and completely safe. And that is what people do here: walking from one place to another, visiting several each night. The city and its residents will carry you along. There are many possibilities to getting around in the city.